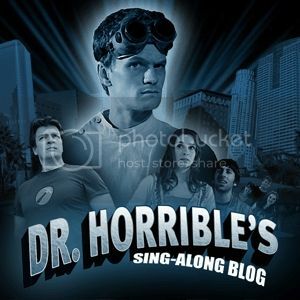 During the 2007-2008 Writers' Strike, Joss Whedon - he of the teenage vampires and space-westerns - put together a cheap, fun, silly blog... show... short film... thing, called Dr. Horrible's Sing-Along Blog. Dr. Horrible (Neil Patrick Harris) has only one great ambition: to be part of the Evil League of Evil. Yet the Bad Horse ("Thoroughbred of Sin!") isn't so sure Dr. Horrible is quite evil enough to make it - PhDs in horribleness don't quite cut it. Interspersed with Broadway-style pop songs, Dr. Horrible plots his various death devices and evil heists. 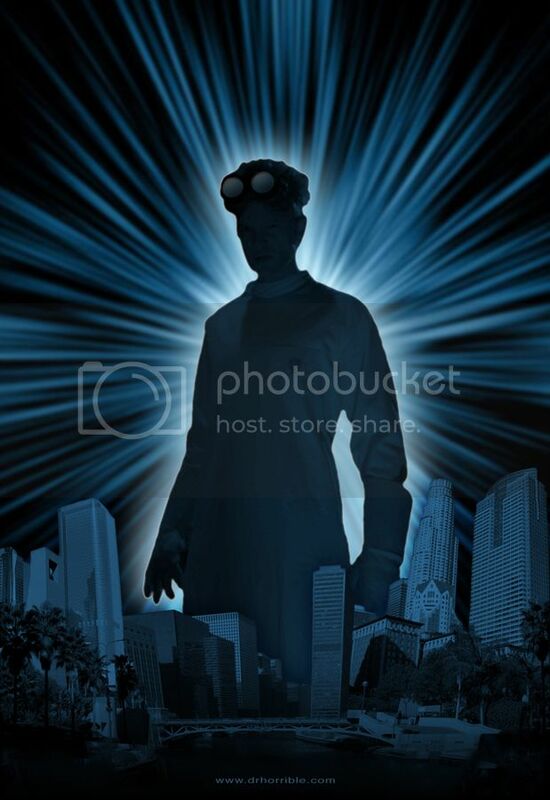 When his arch-nemesis, Captain Hammer (Nathan Fillion), manages to get the girl of his dreams, Penny (Felicia Day), Dr. Horrible is further galvanized into action. Presented in three acts, each lasting 15 minutes, Dr. Horrible's Sing-Along Blog is light, popcorn stuff. Its wafer-thin plot provides only an excuse for silly jokes and silly lyrics. And no comedy stone is left unturned! Joss Whedon is, after all, a very clever man, and he packs it in thick. He is also, it seems, making a good point: that is, in an age of Internet, why do we have entertainment middle-men at all? Cory Doctorow, Rudy Rucker and the Therefore, Repent! guy have already made this point by releasing their stuff under Creative Commons - and purportedly making more money that way too. Who needs publishing houses and advertisement execs when the Internet as Great Leveler exists? In the decentralized chaos of Internetness, any and all have a chance to show off their talents, and reap direct rewards for them. Artists now have direct lines to their consumers! Just think of the British band, Arctic Monkeys, who built their buzz entirely through the blogs. Anyway. By the end of Dr. Horrible, we were waiting for more. The blog... show... short film... thing ends on a bit of a bleak note, with Dr. Horrible getting an awful Pyrrhic victory and Captain Hammer crying into a therapist's couch. Don't torture us with another prematurely over Joss Whedon thing; the power is in your hands now! Thanks for reviewing! Many friends have raved about this, but before we got around to seeing it, my honey and I went to this big sci-fi convention last summer, and everywhere I went, random people with and without lab coats were quoting lines and laughing at each other. By the end of the weekend I said, "I'm sick of Dr. Horrible, and haven't even seen it yet!" Maybe enough time has passed now that I can give it a fair chance. Anarchivist - Hmm, I think it might be a bit hyped because of the Josspower within the world of geekery, and how many geeks feel obliged to worship at his feet. What I'm trying to say is that it's not Monty Python-legendary. But it is cute. Like Thumb Wars!